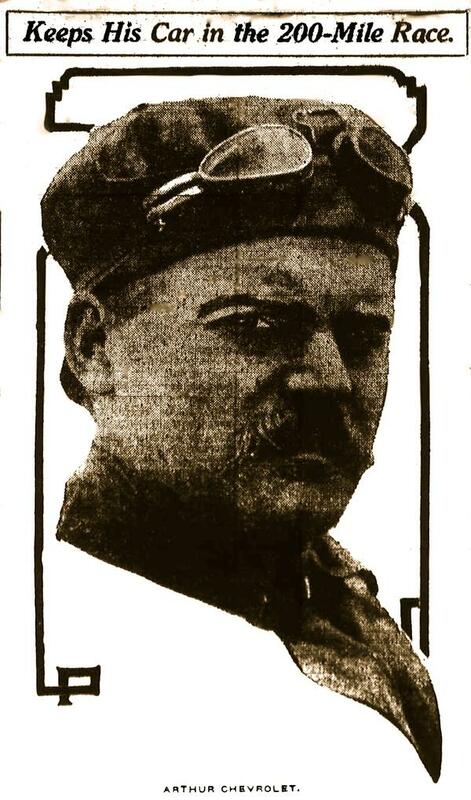 This image of Arthur Chevrolet was captured from a photo which orginally appeared in the May 29, 1910 Indianapolis Star. The original photo was part of the coverage of the May 1910 race meet at the Indianapolis Motor Speedway. These races were part of the May 1910 weekend that included "national championships," a newly-announced distinction by the American Automobile Association (AAA) for select race meets. Car manufacturers were keen to make a great showing. Check out other articles that provide additional summaries on the results of the races staged the previous day (May 27). You can also find an article published May 28 that set the stage for the day's program elsewhere on First Super Speedway. This picture appeared probably in recognition that he acheived some success in the big feature event of the weekend, the $10,000 Wheeler-Schebler Trophy, as the final driver to complete the full 200 mile distance. Arthur Chevrolet (Buick) finished fourth. The remaining survivors of the grind were flagged off before they did the distance. The first three finishers were: Ray Harroun (Marmon "Wasp"); Leigh Lynch (Jackson); Johnny Aitken (National "60"). Winning time: 2:46.31.00. This was a new American speedway record for the distance. Chevrolet was the last of the drivers permitted to complete the full 200 miles. Despite being patriarch brother Louis' right hand man throughout much of their careers Arthur was overshadowed by both Louis and their 1920 Indianapolis 500 winning brother Gaston. The extent that Arthur's life has been obscured extends to the grave. For years there was no record of where he was buried after taking his own life in a fit of depression the world seemed to lose track of him. After discovering a third body along with Louis and Gaston at Holy Cross and St. Joseph Cemetery in Indianapolis those researching the whereabouts of his remains assumed the mystery had been solved and in 2011 a marker was installed. Unfortunately it was a mistake. The third body was actually Arthur's son, Arthur Jr., who passed away of illness as a young man. Arthur Sr. was a marine mechanic at the time of his death in Slidell, Louisiana. He is believed to be buried in a local Catholic cemetery but all records were destroyed during Hurricane Katrina and there is little hope the precise location will ever be identified.